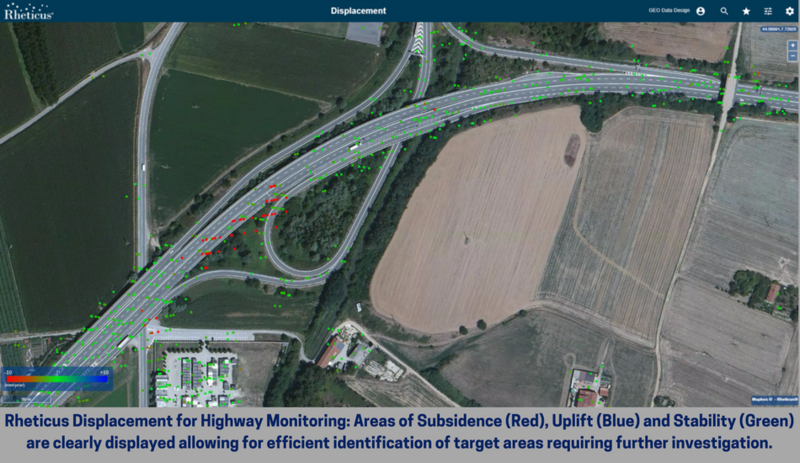 Rheticus® Displacement is a cloud based geo-analytical platform designed for the provision of sophisticated monitoring services. Using Synthetic Aperture Radar (SAR) satellite data it detects and monitors millimetric movements of ground surface. The huge availability of data guarantees intensive surveys, enabling continuous monitoring of any chosen area globally. Information is provided automatically, efficiently and affordably. Maps, reports and indexes are easy to read. Always accessible from various platforms and devices. Data and results are standardized and comparable over time, which saves time and resources. Landslides identification and monitoring for infrastructures planning and management. Urban area and infrastructure stability monitoring. Burned areas mapping and monitoring.